We'd read in many places that Japan is a cycle touring heaven (japancycling.com, etc), so decided to spend 8 days biking and exploring rural Japan. Where exactly was a detail to figure out later. Since we were traveling to multiple countries, we wouldn't have our own bikes with us, so finding a decent bike rental place was the first challenge. This was more difficult than expected. It seems that multi-day bike rentals aren't at all common in Japan, cycle touring presumably not being all that popular domestically. We narrowed down our bike rental options to countryside-chiba.jp in Chiba, near Tokyo, and JapanBiking.com, based in Izumi, Kagoshima. Since traveling on Japanese trains with a bike is a hassle (it must fully bagged-up), starting in relatively rural Izumi made more sense than urban Chiba. Plus the April weather in Kyushu is better in theory than further north in Chiba. So we booked a pair of touring bikes with JapanBiking.com (they also do self-guided GPS and fully-guided tours - we went for the cheap bikes-only option), and took a bit of route inspiration from their listed itineraries. For detailed route planning, we bought a Kyushu Touring Mapple. Aimed at motorcyclists, Mapples are perfectly suitable for pedal cyclists, and their lack of English (or Roman characters) labelling is not too much of a problem for non-Japanese speakers. They have recognisable icons for landmarks like campsites and onsen. To complement the Mapple, Google Maps plus GPS on our phones was very convenient. It's possible to cycle with phone in hand while getting a GPS fix to verify location on the move. So long as you browse an area in advance while on wifi, you don't need a mobile data connection to see that map area later when on the move. 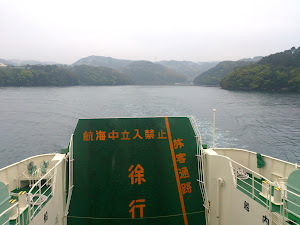 Our starting point, Izumi, is on the west coast of Kyushu, and the series of islands (Nagashima, Amakusa, etc) nearby in the Yatsushiro Sea looked appealing as a start to our touring. We didn't plan the route beyond that since we weren't sure how much mileage we'd cover. Ferries are happy to take bikes, so they could factor into the route. We borrowed waterproof panniers (important since it rained a lot) with the bikes and managed to fit in basic camping equipment as well as clothes etc to give us a backup in case we ended up somewhere without a reasonably priced hotel option. The super-lightness of our Vaude tent (~0.96kg) was appreciated! Setting out from Izumi (known for cranes in winter and a pleasant Samurai neighbourhood) we took the coastal route west, crossing the bridge to Nagashima Island over the rapidly flowing tide in the strait between the Yatsushiro Sea and the East China Sea beyond. Following the coast north west towards the Amakusa ferry at Kuranomoto, we made a detour to a picturesque lighthouse, then put in a few more miles before the light started to fade We must have been looking hungry, because a lady pulled over in a layby to give us a bag of seasoned boiled potatoes. Simple but delicious! Undecided whether to camp, we ended up stopping at the Nagashima Sunset hotel and onsen. The hotel is a little dated, but our first experience of an onsen (Japanese communal baths) was a good one - very relaxing. Heavy rain set in overnight (glad we didn't camp! ), so it was a wet ride to the ferry terminal in the morning. Our hopes for a nice breakfast at the terminal were perhaps over optimistic; there's just a few vending machines. A sickly-sweet hot canned latte kept us going until we could pick up more food at the supermarket in Ushibuka on Amakusa island after the 40 minute ferry ride (see schedules at t-island.jp/en/). We took the quiet road along the eastern Yatsushiro Sea side of Amakusa, passing small fishing villages and paddy fields along the way. Traffic was light and we mostly had the narrow but well-surfaced roads to ourselves. Stopping at Hondo 'Amakusa town' in the evening, Guest House Spring was a friendly traditional Japanese place for the night with tatami matting and futons (as opposed to a western-style bed). Hungry but tired, we dined on take-away bento boxes from Hotto Motto, a common chain that was pretty tasty to our uneducated palates. Sunshine returned the following morning as we set off over the bridge from Amakusa to Ueshima island. The road along the north coast was quite busy, the longer route along the southern side of the island may have been nicer in hindsight. Given the nicer weather we decided to camp and searched out a campsite marked in the Mapple on the small island of Maejima. We found it closed (unclear whether it was too early in Spring, or permanently closed), so continued 8km over several large bridges to another site on Nokama-shima island. It was a cold evening, but we had the camp site (really just a generously sized back garden) to ourselves and there was a nice sunset. Continuing along the main road on Oyano island, we crossed the bridge back onto mainland Kyushu and set our sights on Kumamoto. An hour or two later, we were following Google Maps around the streets of Kumamoto and finding our hotel, booked online a couple of nights earlier, without mishap. There was enough time that afternoon for some sight-seeing, so we walked up to the large and impressive Kumamoto Castle. With metabolisms fired up by the biking, we pigged out on pizza for dinner. After four days in the saddle, we were ready for a rest, so opted to take the train for the round trip to Mt Aso instead of biking the 50km each way. Mt Aso is formed of multiple volcanic cones within a much larger caldera formed by a collapsed magma chamber. The Nakadake crater was belching cloud of sulphurous steam from an emerald green crater lake. Quite a dramatic sight. The rain came back as we returned to the biking and we put off our departure until early afternoon to avoid the worst of the showers. Leaving central Kumamoto, we stopped by Suizenji Gardens, traditional Japanese styled ponds, islands and topiary trees, then continued through the urban sprawl south towards Yatsushiro. It was difficult to find quiet roads, so we ended up taking the direct but busier route along road 14 south. The Toyoko Inn (budget business hotel) at Shin-Yatsushiro was a welcome sight after several hours pedalling against a headwind in the rain. Aiming to leave behind the busy roads of the previous day, we cut through Yatsushiro on cycle paths next to the Shinkansen line, then following the left bank of the Kuma River upstream along tiny roads and tarmaced byways. It was a picturesque route and we saw numerous other cyclists for the first time. Apparently there was a cycling race along the same route, which explained why we were shepherded along by marshals in high-vis jackets from time to time; they even helped us fix our punctures! Leaving the river behind, we climbed through small villages, then steeply up hairpin bends along the almost deserted route 60. We surprised a man standing in a layby singing energetically, practicing his scales assisted by the fine acoustics of the steep valley sides; perhaps training for his next karaoke session. Having conquered the climb, we took the almost hidden route 272, a lovely winding trail through bamboo and orange groves, down towards the coast at Higotanoura. It seems to serve only the orange growers and we didn't see any other traffic on our descent. Back on busier roads, we took the mile-long tunnel south to Uminoura. This wasn't particularly pleasant, rather tight with passing vehicles; the longer coastal route would be nicer. Continuing south, we took scenic route 56 around Ashikita Kaigan Prefectural Natural Park. The small villages and rocky peninsulars were reminiscent of west coast Scotland. Our original plan had been to stop at one of the onsen resorts south of Tsunagi, but weariness and lack of Japanese language skills led us to take the easy option of the budget 'Super Hotel' in Minamata instead. Just a half day to return to Izumi today. We took the quiet road 117 up the river from Minamata, climbing a few 100m through a traditional onsen town. The long climb was rewarded with a downhill cruise most of the way to Izumi. We took a detour to explore the Samurai neighbourhood, then handed back the bikes and had a well deserved soak in the hotel's onsen, satisfied with ~350km cycled since we left Izumi the previous week.